Here’s one more pick for Father’s Day. 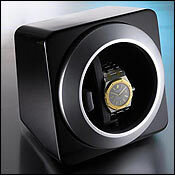 For the uninitiated, it’s a watch winder. It keeps your automatic watch running when not worn—an automatic watch will stop if it isn’t worn for over a day or so, which some people find highly annoying. Most winders are noisy and expensive. This one is completely silent, about $100 (which is about $200 less than others), will fit watches of many sizes and has a choice of timers. It is all the rage amongst my friends who know watches (thank you Paul, for the tip). $99.95 at The Sharper Image, multiple locations; sharperimage.com.